Did 2017 spit you out feeling demoralized, angry, confused, and/or frustrated? Quick, go see Man of La Mancha! Custom Made Theatre’s production of this marvelous show by Dale Wasserman (book), Mitch Leigh (music), and Joe Darion (lyrics) is much more than a nostalgia trip. It’s a rousing cheer for the bright side of humanity: not just love but honor and aspiration. I had qualms about revisiting a show I’d loved 50 years ago when Richard Kiley first rode his imaginary Rosinante into New York’s Circle in the Square. 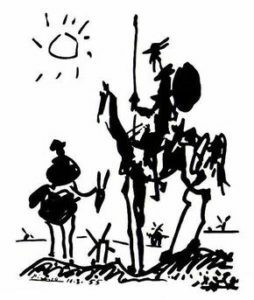 When I saw Man of La Mancha again, decades later, at the Cape Cod Melody Tent, a thunder and lightning storm lit up the climax. Could a small local company do justice to a picaresque full-size musical on a stage the size of a San Francisco apartment, broken up by wooden beams, with the actors playing all the instruments? OK, the production is a bit rustic. Not every supporting actor is excellent, although each of them excels at something. But Edward Hightower was born to play Cervantes/Quixote — swelling each moment with drama, pivoting in a breath from the mad old knight to his pragmatic creator. As the innkeeper, Anthony Aranda also is outstanding, and Rachael Richman makes a convincing Dulcinea. 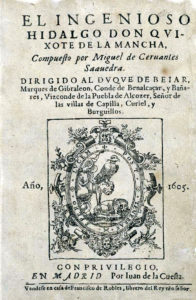 Best of all is the show itself: an inspiring, energizing reminder that human civilization has been stumbling over itself at least since Cervantes wrote this pioneering novel 400 years ago. Read about, or buy tickets to, Custom Made’s production here — running now through Feb. 17 at the Shelton Theater.